In an historic day for Canadian and International football, the Canadian Northwind beat the US Revolution 45 to 32 on Saturday August 4. The 49th Parallel Cup game was played on the spectacular Thunderbird Stadium on the UBC Campus in Vancouver BC, in perfect conditions for footy. This was the Northwind's first ever victory in International football over the Revolution and the Canadian leadership was excited to have the win during a football carnival that saw around 2500 people come through the Thunderbird Stadium gates to watch non-stop footy over the two days. The weekend saw two internationals between the Northwind and the Revolution as well as the first two Women's Footy Internationals between the Canadian National Team and the US Freedom, U17 Northwind against the U17 Revolution, and local teams competing in the BC Footy Cup. The official 49th Parallel Cup took place on Saturday afternoon. Both teams put in everything they had to winning the game and it was a hard fought affair. Things were pretty even for most of the game, but in the last five minutes the Northwind were able to kick a couple of unanswered goals to take their first win of the series. Northwind Head Coach, Mark Block, was thrilled with the victory. "For the Northwind to get this monkey off its back was great for Canadian football and I think it will open up some people's eyes." Steve Carew played in the Back Pocket and was best afield for the Northwind. Carew was ably assisted by Assistant Captain (Vice Captain) Aaron Falcioni and Matt Lowden who was able to do the job on Revo key forwards Justin Valley and Chris Carol. Obviously, Revolution Head Coach Trevor Lovitt was not nearly as pleased. "I was really disappointed with the performance on Saturday. We didn't play to my expectations and I don't think those expectations were too high." Lovitt felt that the Revos played some pretty ordinary football, but conceded that you can only play as good as the opposition will let you and said the Northwind played really well and applied a lot of pressure throughout the game. Lovitt was a lot happier with Sunday's performance which the Revolution won 35 to 29. "We played a lot better on Sunday and in fact we had 13 scoring shots to 7 but just didn't kick straight." Overall both teams were very pleased with the weekend in terms of their preparation for 2008. Both recognize that there are not a lot of opportunities to play International football and so the Northwind/Revolution series has become integral to each countries preparation. According to Lovitt, "The weekend was both about getting the team prepared for Melbourne and seeing the players and choosing a team. We really got to see a few guys put their hands up this weekend. We gave guys an opportunity and the weekend gave us a good insight into who should go to Melbourne and gave the players a good insight into our game plan." Lovitt believes that there is a lot of hard work for the Revos before Melbourne and that the team really needs to work on its skills, decision making and especially its kicking for goal. That said a number of players have put their hand up for Melbourne including San Diego team mates Justin Valley and Brandon Blankenship, BW Eagles Chris Carol and Jay Levesque, Nashville Kangaroos Dee Vsetecka and Luke Nemeth. Other Revo notables were Marty Curry (LV Gamblers), Donnie Locero (OC Bombers), George Lakomy (Boston), Pat Miller (Philly Hawks), Jeff Fisher (Denver) and Jeff "Fingers" Purcell (Seattle). The Revolution were without former player and briefly head coach, Tom Ellis who stepped down from his position as Assistant Coach to concentrate on his many roles for USFooty including West VP and taking his Bulldogs back to the USFooty National Championship. Lovitt says that he is not planning to replace Ellis and is happy with is his team both in the US and in Melbourne. For their part, the weekend was more than just one match for the Canadians. AFL Canada decided to take a risk on this tournament and contracted with Thunderbird Stadium to have full access to the tickets and concessions. The tournament was also heavily promoted in Vancouver. If the smiles on their faces was anything to go by, AFL Canada was very pleased with the success. According to Block, "to get so many people watching footy over the weekend was just fantastic. This should be huge benefit for local footy in BC and Canadian footy in general." According to Block, former AFL Canada President Bruce Parker had a fantastic weekend - not only did he have one of the best tournaments of his career but he was one of the major contributors to organizing the weekend and making it such a great success. Next for the Revos and Northwind is the Convicts Tour. 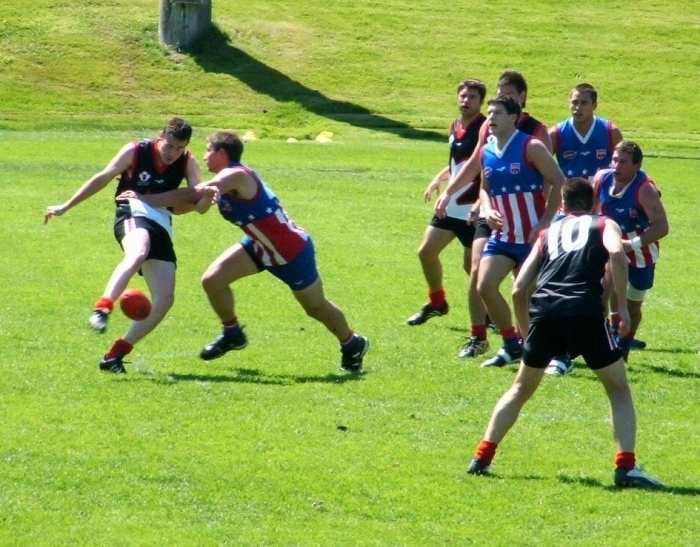 It is our understanding that the Convicts will be visiting the USFooty Nationals in Louisville KY and then playing the Northwind as the curtin raiser to the OAFL Grand Final in Toronto the following weekend. The weekend also saw the unveiling of the US Freedom who dominated the Canadian National Team with a 7.7 (49) to 0.0 (0) win on Saturday and a 14.13 (97) to 0.0 (0) victory on Sunday. We'll have more on that later, but for an immediate full report go to USFooty.com. The fact that the event included paid admission and still got a very healthy sized crowd, which can only add to the atmosphere and professional feel of the tournament, is very significant. Having a quality enclosed stadium is a huge advantage towards that goal. Congrats to the Northwind. They've had some close calls against the Revos over the years, and they had a shocking run of bad luck and close losses at the 2005 International Cup. Great to see some reward for their efforts. Commiserations to the Revos - is it any consolation if I said the result was good for footy? Well done to the US Freedom side. A shame the women's matches were so lopsided on the scoreboard - it was always going to be revealing as to how strong the two squads were.